Every now and then, I come across a deal that is just too good not to share. 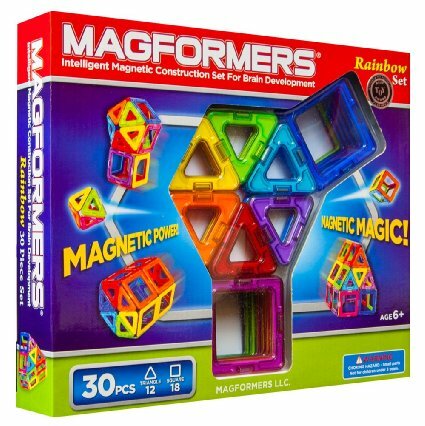 Today only, select Magformers sets are 40% off at Amazon. This has the coveted 5 ***** rating. The most popular sets will likely sell out at this price point, so if you’re interested, don’t wait — if it’s anything like last year, your selection will be more limited as the day goes on. Some sets are recommended for ages 3 and up, others are marked for ages 6 and up. My son started playing with Magformers at age 3, and still plays with them now, several years later. I first learned about them through extended family (there was talk of these being something of a miracle distraction for little ones at restaurants). That momma who passed the word along deserves a mothering medal for discovering these! We started with a small set, and they far exceeded my expectations — we’ve purchased several sets since! A handful of these provide a perfect distraction for eating out, quiet play at church, and for learning and play right at home. Little ones will surprise you with the 3-D shapes they’re able to think up. These make wonderful Christmas gifts, and they’ll be enjoyed for years to come. Categories: Uncategorized | Tags: Amazon, Award Winning Toys, Best Educational Toys, Best Kids Toys 2015, Best Toys for Christmas 2015, Christmas, Deal of the day, magformers, online deal, top toys | Permalink.